Bali is Indonesia’s favorite tourist destination, known for its natural attractions, perfect climate and relaxed atmosphere. This island of flowers, temples and friendly people is considered a real gem by travelers worldwide. 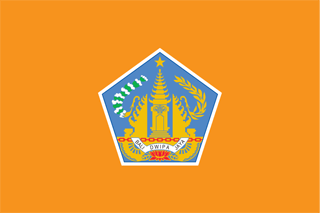 The flag of Bali contains the province coat of arms, centered on a light saffron background. This entry was posted in 200-Hour Yoga Teacher Training, 200-RYT Teacher Training, Alchemy of Yoga, Uncategorized, Yoga Teacher Training and tagged alchemy of yoga, alchemy tours, bali yoga teacher training, silvia mordini. Bookmark the permalink.